IOT Office Door Sign using PyPortal by @mikerenfro @adafruit @circuitpython #IoT « Adafruit Industries – Makers, hackers, artists, designers and engineers! mikerenfro/iot-office-door-sign: IOT Office Door Sign using PyPortal. My previous job was research and development engineer for a university. That meant I spent a fair amount of time outside my office (across multiple buildings), and students, faculty, or staff would not know where I was, or when I was returning. Even if I left sticky notes on my door, it was pretty likely I’d get pulled from one location to another before I could return to my office and update the sticky notes. So I mounted a Chumby to the window in my office door, and connected its RSS reader app to a feed I could update remotely. It was a little bit hacky, as I had to cycle the Chumby display between the RSS feed and a clock to ensure the feed display was up to date. When the Chumby service was being discontinued, I had to migrate to booting an alternative firmware from a flash drive. 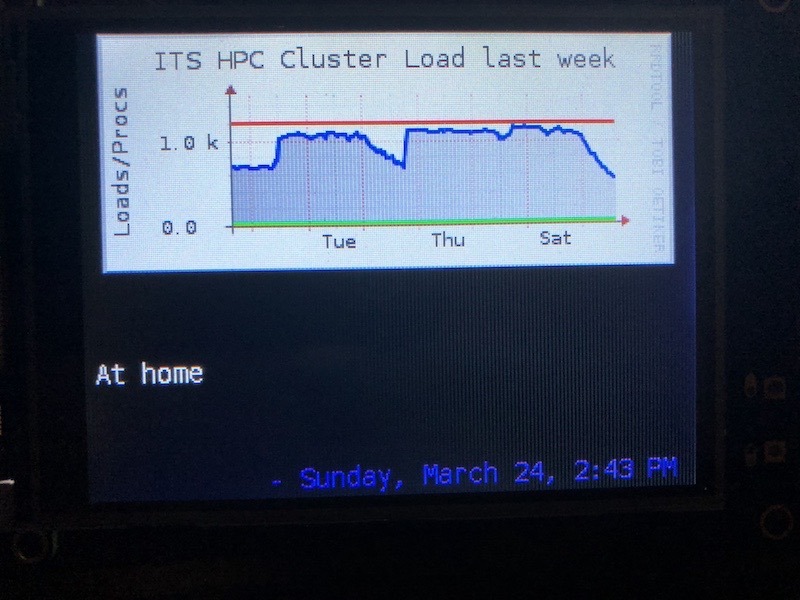 After I changed jobs to high performance computing systems administrator for the university, I don’t get summoned across buildings as often, but it still happens, and now I have some graphs of HPC usage I’d like to publicize to passersby. So the Chumby was modified to alternate between displaying a PNG of my HPC’s usage and displaying my RSS feed. And then, my Chumby died sometime last year. So it was finally time to explore other options, and the PyPortal had just launched. The cost of a Raspberry Pi and an LCD was more than I wanted to spend initially, and would have been bulkier.